This international family took a hobby from home, did what Finns had given up on and turned it into a business. Now we can buy their product at Alko and the Helsinki Opera House. When you visit the Helsinki Opera House this year, be sure to ask for Finnish wine at the intermission. You will be treated to a wine with international honors- made from cloudberries. Espoo-based Finnviini Oy CEO Paola Guerrero de Cohen and chief winemaker David Cohen had been enthusiastic home brewers of wine and beer when they lived in Boston, tapping into long-standing traditions of the local Italian-American community. Upon moving to Finland for Mr. Cohen’s job, they wanted to keep the hobby. But buying grapes in Finland was not an option. When they saw the wealth of fruit in the Finnish countryside, they realized that they would have the chance to learn to make wine from something other than grapes. After some experimenting and market research, they felt that they could make this hobby a business. After trying various local fruits, they found cloudberries to be the easiest to develop; the unique flavor of the berry stays throughout the fermentation process. When they got it perfect, they called it Valokki. Others agreed that Valokki was a quality wine; it was awarded the silver medal at the International Eastern Division of the East Meets West Wine Competition in Sonoma Valley, California. Valokki has been available at the Helsinki Opera House during intermissions throughout 2016 and 2017. The most satisfying for the Cohens, though, has been their bilberry-based wine, Sametti. The fermentation process needed a lot of tweaking to bring out the flavor. But it worked. In February 2016, they entered the Sametti- along with the Valokki- in the East Meets West Wine Competition. Sametti took gold, but didn’t stop there. In July of 2016, Sametti took silver in Australia’s International Melbourne Wine Competition, the only non-grape wine to win a medal in this important competition. Besides these two international stars, Finnviini produces wines based on garlic (a cooking wine), lingonberries, beetroots and raspberries. The lingonberry-based wine is a fresher alternative to glögi in the winter. Even its name- Kaamos- evokes an evening by the fireplace while looking out at a Lappish landscape of snow and stars. Kaamos is the Finnish word describing the long Arctic night. The results of the wine production are clear. But Finnviini is a business and faces the same challenges that all small businesses face. In fact, they have even more challenges than most, as the production and sale of alcohol is heavily regulated in Finland. The first thing that they noticed was that Finnish wines were not being promoted as a gourmet beverage. When they first floated the idea of a winery, their Finnish friends told them of the sickly-sweet home-made wine of the past. “We have approached some restaurant managers who have liked the wines, but weren’t sure they would be able to sell them,” said Ms. Guerrero de Cohen. In addition to changing minds about Finnish wine, the Cohens have needed to work through the regulatory jungle. Finnish law dictates where and how alcoholic beverages can be produced, marketed and sold. As the Cohens are both immigrants- Ms. Guerrero de Cohen is originally from Ecuador and Mr. Cohen is originally from the United States- there are other challenges. Wine production requires good connections for supplies- berries, bottles, etc. The Cohens have found that breaking into the Finnish networks and finding trusted suppliers has taken longer than they expected. The business advice they got from EnterpriseEspoo has helped them forward. Finnviini has met these challenges head-on and the future looks bright. Since November 2016, Sametti has been on the shelves of the state-run alcohol retailer, Alko. In fact, Alko has included the wine in their selection celebrating Finland’s Centennial. Ms. Guerrero de Cohen has high hopes that strong demand will push Alko to continue ordering locally-produced wine. 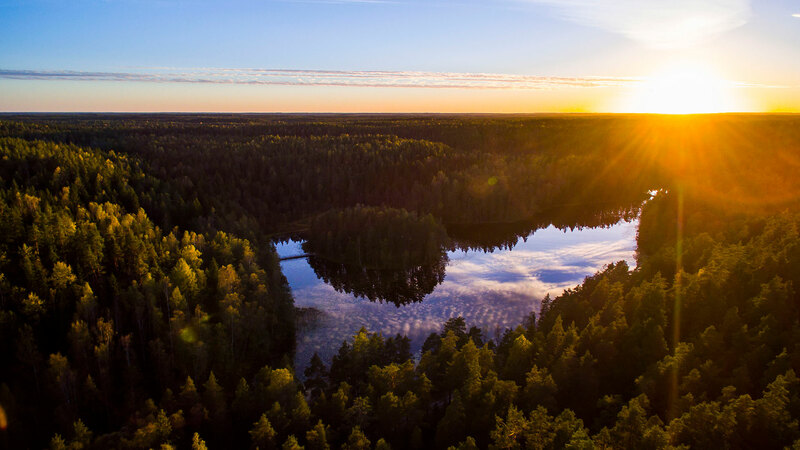 Towards the end of the Centennial year, Finnviini expects to release a sparkling wine that will allow everyone in Finland to pop the cork of an exceptional Finnish wine. Finnviini’s strategy over the next few years also looks at export markets. Around the world, non-grape wines are gaining in prestige. Finland’s reputation for quality and natural purity should also help Finnish wines compete. They made a big step in this direction at October’s SIAL Paris food exhibition as a part of the Food from Finland pavilion. Their models are the trendy wineries of traditional wine regions, which produce small amounts of highly-anticipated wines. Find an untapped or underutilized resource. Make sure that the resource is hard to replicate in lower-cost areas. Appreciate what you have in Finland- and use it as an advantage!